Aluminum Electronics Plate for Slash 4x4 (Blue) Discounts Apply ! 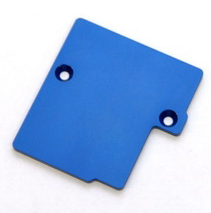 SPTST6877B - Aluminum Electronics Plate for Slash 4x4 (Blue). CNC Machined from 2.5mm thick aluminum, our Slash 4x4 ESC mounting plate provides a solid flat piece of surface area for mounting most electronic speed controls on the market today. Using existing chassis holes, our electronics plate even accommodates and supports the Velineon ESC. Machined from thick aluminum, this plate will not flex or twist like fiberglass or lexan material mounting plates and prevents damage to the ESC. Our ESC plate also retains the use of the original Traxxas receiver box, ST6877B.